Natural Edge Fine Furniture specialises in jarrah and marri furniture, but also uses other timbers such as sheoak, blackbutt, oak, and spotted gum. 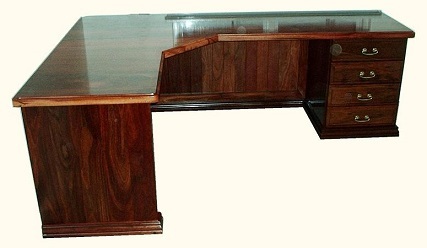 We offer a number of standard designs, but we specialise in custom made furniture. Customers can choose from many design variations – standard or natural edges, antique or contemporary profiles, or feature inlays. Come and discuss your ideas with Cameron to have your furniture made to your personal requirements. We will even convert your ideas into 3D drawings to illustrate what your furniture would look like before we commence manufacture. We use a range of timbers, but jarrah and marri are the most common. Jarrah, with its dark colour and interesting grain, gives a classic rich deep appearance to the furniture. Marri is often used to create a light appearance in modern homes, and the gum veins in this timber are an attraction. Sheoak timber can produce different finishes depending on the way it is milled, and this characteristic can be used to create a unique ‘glistening’ finish. Oak and spotted gum are light timbers that do not have the gum feature of marri, and these are becoming popular for light coloured furniture. 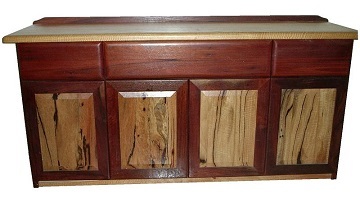 Blackbutt is also commonly used. Natural Edge Fine furniture manufactures dining tables and chairs, coffee and other small tables, buffets and wall units, entertainment units, bedroom furniture, wine racks, and other general items and gifts. We produce items for commercial organisations as well as domestic clients.